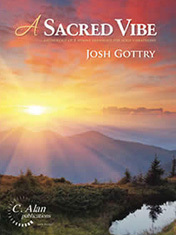 A Sacred Vibe was written to provide recognizable but unique arrangements of familiar hymns for 4-mallet solo vibraphone. Included in this collection are a prelude on O God Our Help in Ages Past, a meditation on Fairest Lord Jesus, an offertory on Jesus Loves Me, and a postlude on Praise to the Lord, the Almighty, along with several others. All arrangements in this book are playable on a 3.0-octave vibraphone. I hope this collection will help you, and those who listen, enjoy these classic hymns in a new way!